How would you describe mornings in your home? Do you rush around trying to make sandwiches and sign field trip forms before the bus arrives? Do you yell because your kids dawdle or whine that they don't want to wear the outfit they picked out the night before? Do you feel stressed, exhausted, anxious, or irritable? 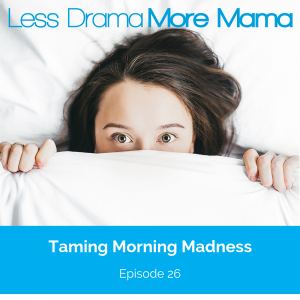 Many moms struggle with some form of morning madness, but you don't need to be one of them. Tune in for today's episode as I share how to make your mornings calm, peaceful, and predictable. Why routines are so important for kids and adults. How to save and create more time in the mornings. The importance of paying attention to your morning thoughts. What works for me and my family’s morning routine. Tips to help make your mornings run more smoothly.